Few places in the world have as much to offer as Spain when it comes to epicurean golf adventures. The country possesses a rich history, vibrant culture and dynamic cities thanks to the indelible imprint of past Roman, Arab, Christian and Jewish inhabitants. In Spain, you may experience whitewashed mountain villages in Andalusia, sun-soaked Mediterranean shores, the arts and architecture magnificence of Barcelona and the Guggenheim in Bilbao, as well as the charm of old Spanish cities like Seville, Cordoba, Granada and Toledo. Spain also offers exceptional golf and a progressive culinary and wine scene, making it a truly outstanding CORK & TEE epicurean golf vacation destination. 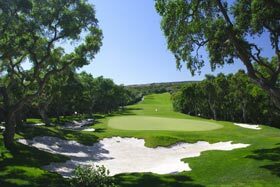 A key milestone in the evolution of championship golf in Spain was the 1997 Ryder Cup held at Valderrama, a spectacular Robert Trent Jones, Sr. design draped across the Costa del Sol’s Mediterranean landscape and one of the finest courses in Europe. The Ryder Cup drew attention to the high degree of quality golf available in Spain and contributed to a boom in course construction that continues today. All across Spain exceptional new courses are springing up from the Basque region in the North to inland Andalusia in the South and points in between. In the Costa del Sol, other notable tracks among the more than 30 courses that may be played year-round include the venerable Sotogrande, as well as La Reserva and Almenara. An hour north of Barcelona in the Costa Brava you will find the second golf magnet in the country. PGA Golf de Catalunya, the region’s standout course, includes 36 challenging holes set amidst pine and cork trees in the scenic foothills of the Pyrenees. A host of other Costa Brava courses offer challenges to golfers of all skill levels. Barcelona itself includes 45 spectacular holes at the Greg Norman-designed Real Club de Golf El Prat, a private club accessible to CORK & TEE clients. Like golf, the epicurean scene in Spain is on the move. 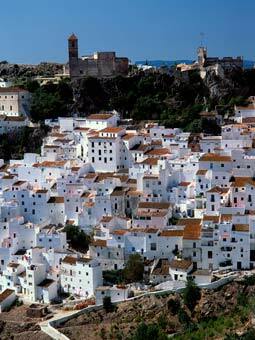 Winemaking on the Iberian Peninsula dates back more than two thousand years to the Phoenicians. In recent decades, the country has been best known for its red wines from La Rioja and for its Sherries, but today exceptional Tempranillos from Ribera del Duero and other reds from up-and-coming appellations such as Priorat are receiving much attention. Spain also is highly regarded for its whites such as the ultra crisp Albarino, which marries so well with seafood, and more medium-bodied wines such as Rueda, based on the Verdejo grape. We love Spanish wine and particularly like that wine country in Spain consists largely of undiscovered countryside and charming wine villages such as Laguardia, thus far unspoiled by tourism. In gastronomic circles, Spain is the “it” place in Europe. Spanish cuisine no longer is simply tapas, gazpacho and paella, or outstanding hams like Jabugo and Serrano and cheeses such as Manchego and Cabrales. Chefs like Ferran Adria (Catalonia) and Juan Mari Arzak (Basque region) have achieved cult followings thanks not only to great food, but also to bold new techniques. Gourmet magazine aptly called Adria “the Salvador Dali of Spanish cuisine” for his focus on delivering unexpected contrasts of flavor (banana wrapped in hot peppers), temperature (hot ice cream), and texture (flavorful foams instead of sauces). CORK & TEE will ensure that you have the opportunity to experience the best of both new and traditional Spanish cuisine, and you may even have a go at making tapas yourself if you so desire. 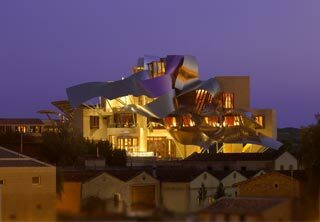 In terms of accommodations, we have scoped out a wide range including ultra modern boutique properties in Barcelona, historic hotels and even unique winery accommodations. We look forward to handcrafting an epicurean golf adventure Spanish style for your group. Contact us so we may have the privilege of handcrafting your CORK & TEE travel experience.